Was Stonehenge designed as a giant xylophone? Stonehenge has been a mystery for thousands of years. Built by Neolithic Britons at some time between 3000 BC and 2000 BC, this cryptic collection of giant standing stones represents a huge undertaking. Clearly it meant a lot to the people who designed and built it… but what, exactly? A new group of researchers has a theory, based on a unique property of the bluestones which were quarried and carried all the way to Stonehenge. 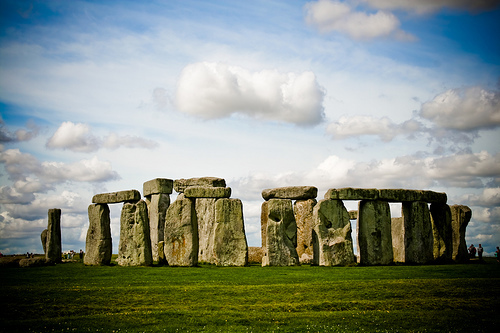 Unlike other types of stone (notably, the kinds of stone which are found local to the site), the bluestone used at Stonehenge rings when struck with a small hammer. Most rocks produce a thunk or thud noise, but apparently the bluestones "sing" with a "much more melodic tone." The research team from London's Royal College of Art was allowed to test their theory recently, when English Heritage gave them leave to bang on the Stonehenge stones to see what noises they make. The team found that "it was a noteworthy soundscape," and speculate that ancient people may have thought the stones had magical properties because of the amazing musical tones they made when struck. It still raises the question of why drag the stones all the way to Salisbury from their quarries in Wales. Why not just set up your giant xylophone near the source of the rock? Clearly more was going on with Stonehenge than its potential use as a giant outdoor musical instrument. There have been dozens of theories about Stonehenge floated over the years. The current reigning theory is generally calendar-related, to help local people mark the passage of time and the seasons. This theory works nicely as an umbrella theory, in that you can fit a lot of other uses in there, too. Maybe they wanted to perform ritual sacrifices on the right days, or believed that the sick could be healed when the constellations were in a certain alignment. There is also a solid theory that Stonehenge was part of the ancient people's rituals for their dead. It would have marked the end of a funerary procession which began to the east, at sunrise at Woodhenge, and ended at Stonehenge at sunset. This theory is bolstered by the traces of ancient cremated human remains found in the soil at Stonehenge. Although again, this doesn't preclude Stonehenge's use as a giant calendar. Did they strike the stones to make impressive noises as part of their rituals? Perhaps so - perhaps not - we will likely never know for sure.